It's a well-known fact that the fashion industry is one of the biggest industrial polluters in the world. Based on 2015 estimates, it's responsible for 1 715 million tonnes of annual CO2 emissions and produces around 92 million tonnes of solid waste per year. On average, 79 billion cubic metres of water are consumed for clothing production yearly – enough water to fill almost 32 million Olympic-size swimming pools! Aspiring to improve sustainability practices in the fashion industry, a fashion-tech firm and a forward-thinking fashion brand have teamed up to transform a collection of wardrobe essentials into new, completely biodegradable materials. Supported by the EU-funded WEAR project, the team's innovative process has the potential to significantly reduce fashion's environmental footprint. "We designed a capsule collection of wardrobe essentials, focusing on garments that almost everyone owns and wears in everyday life, such as bomber jackets, jeans or shirts. And it was really important not to compromise the design decisions but still make a product that is sustainable, biodegradable and recyclable," says project partner Sabinna Rachimova, the founder of fashion label SABINNA, in a WEAR video. The novel process centres on the concept of circularity. The materials used in the collection – in this case cotton and viscose – take full advantage of circular production and recycling processes. This means that the clothing created won't be worn and then at some point thrown away. Instead, at the end of the garment's life, the materials used to make it can be dissolved and turned into new materials. These materials are then transformed into garment packaging, tags, shop interiors and a range of other applications. The project partners' innovative technique is based on simple organic chemistry. Using non-toxic chemical processes, the garments are dissolved into cellulose fibres and reformed into new, 100 % cellulose-based materials. The new, fully recyclable and biodegradable materials created are later compressed into flexible sheets similar to tissue paper, paper, cardboard, plastic and even wood. Further reducing the environmental impact, the processes require minimal chemicals, and sometimes no chemicals at all. By choosing chemical over mechanical recycling, less water is used. 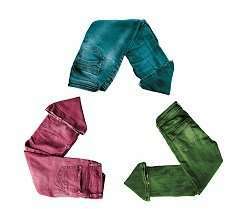 The significance of this water-saving measure becomes clearer if we consider that around 10 850 litres are needed to make one pair of jeans, and 2 720 litres for a single T-shirt! Chemical processes also generate less waste and have lower carbon emissions, contributing towards a smaller energy footprint. The capsule collection demonstrates that sustainable practices are possible without having to compromise on aesthetics. Thanks to the team's new method, any designers creating clothes made of 100 % cotton or viscose are essentially ensuring that their garments can be recycled. Cotton and viscose clothing can even be reclaimed from landfill sites and processed to yield clean and biodegradable materials. The project team is now exploring partnerships with other fashion brands to improve sustainability practices across the industry. Now in its second and final year, WEAR (Wearable technologists Engage with Artists for Responsible innovation) has been working to engage technology and engineering firms in a closer relationship with designers and artists across Europe. Their aim is to shift the development of the wearables and e-textile landscape towards a more sustainable and ethical approach.